These kindergarten handwriting tips and pre-writing activities are designed to help your child establish a good foundation for future handwriting skills. Because I believe that young children should NOT be spending a lot of time on seat work, these activities are designed to prepare your kindergarten child for handwriting, and not just for practicing letter formations. 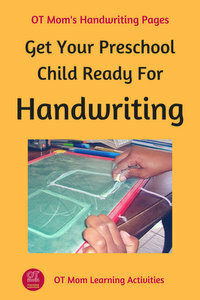 Merely sitting your child down to practice a handwriting worksheet will probably not help much! 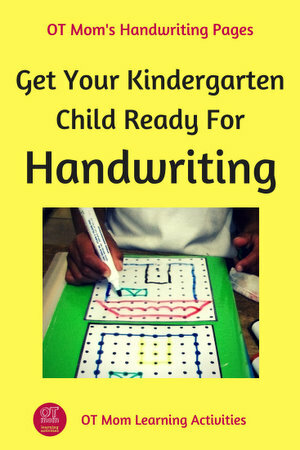 You can help prepare your child for kindergarten handwriting by working on the underlying pre-writing skills. In preschool and kindergarten, children should be using large movement activities to improve eye-hand coordination skills, and then transferring these skills to short periods of pencil-and-paper activities. Working on eye hand coordination will help your child to be able to work within the lines when formal handwriting begins. Set up a suspended ball in a net and have your child practice hitting it with a bat or even just pushing and catching it. Draw a long path (random loops and squiggles or a pattern) on a blackboard or outside wall, and have your child trace over your path. Although I do not recommend lots of desk work in kindergarten, there are times when some paper and pencil visual motor activities can be really useful. 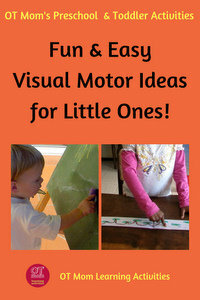 These awesome LONG visual motor printables were a hit with my kids. They can be laminated to use over and over with wipe-clean markers. 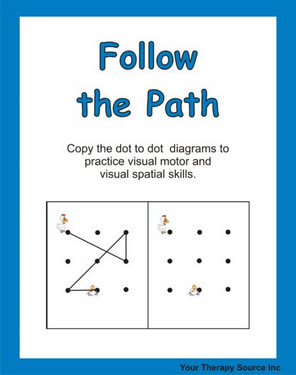 Visual motor worksheets that include mazes, overlapping lines, and tracing paths are also useful for working on eye-hand coordination skills. This will help your child to write more neatly in the lines when formal handwriting begins. 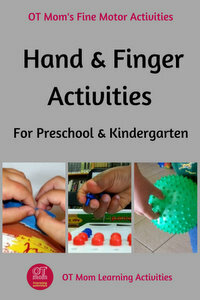 You can browse more eye-hand coordination activity ideas on my site. Your child needs to develop visual perceptual skills to help see the differences between letters and numbers to help with the correct formations. Try some visual discrimination activities such as Where’s Wally and other puzzle books, and visual memory activities like Concentration, to boost visual perceptual skills. If visual memory is good, it will help your child to remember what letters look like, and will also help your child learn to copy words down from the board more quickly, as he/she will be able to remember what was seen and not need to check back as often, which can slow your child down in a handwriting lesson. Fine motor skills play a big role in kindergarten handwriting. By now your child may have learned to hold a pencil correctly. However, just being able to hold a pencil does not mean that the hand and fingers are ready for lots of handwriting! Keep the hand muscles growing stronger with lots of scissor cutting and playdough activities, and work on increasing finger dexterity. This will help your child to control the pencil, which will help with attaining neat handwriting. Strong hands will also tire less easily, which means your child will have a better chance of keeping up with the volume of writing required from the first grade onwards. Try some hand strengthening exercises! Remember, cutting out along a line also helps your child to focus visually on what the hands are doing – a good start for kindergarten handwriting! Elsewhere on my site, I have explained visual-motor integration in some detail. As far as kindergarten handwriting is concerned, visual-motor integration (VMI) plays an essential role in helping your child to be able to copy/draw shapes, numbers and letters. VMI helps your child to perceive the shape/number/letter and then to form it correctly. The kindergarten child whose sheet is shown here, had poor VMI, and was unable to copy age-appropriate simple shapes accurately. In Kindergarten, you can reinforce the copying and drawing of shapes, before working on numbers and letters. If your child struggles with numbers and letters, go back and check that they can draw shapes and intersecting diagonal lines properly. If they struggle with shapes and diagonals, then spend some time on those areas. After your child has spent some time working in large formats, try some simple grid pictures or dot pictures for your child to copy. These 2 sets of printable (downloadable) worksheets have been a big help to me (these links open in a new window/tab): Follow the Path and Grid Drawing. 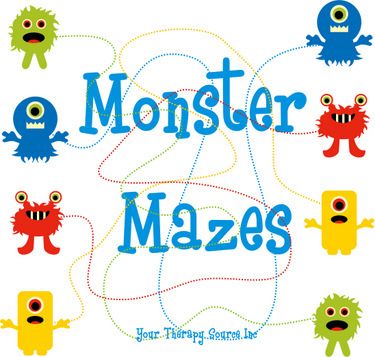 Monster Mazes also has pages that work on visual-motor integration as well as eye-hand coordination. It is really important that your child learns the correct number and letter formations once you start working on letters and numbers. Handwriting Heroes is a lovely program that teaches your child letter formations in groups of similar letters, with rhymes, stories and interesting pictures to help reinforce the correct formation. 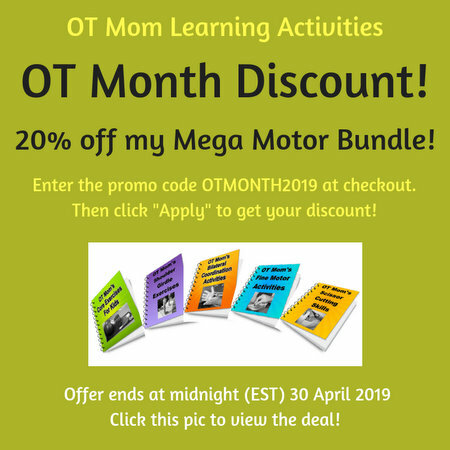 Checkout my letter formation activities, and my page of letter formation tips and strategies for ideas to help your child master these skills! 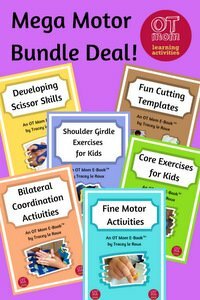 My OT Mom E-books contain a variety of gross and fine motor activities that you can do at home to help prepare your child for handwriting. For the price of a couple of coffees, you can download, save and print loads of activities to help your child develop the skills needed for school. Pocket Full Of Therapy have a massive range of hands-on resources to develop your child's skills. Click on the images to view my favorite resources on their site. 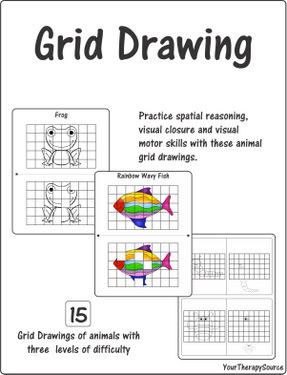 Use these printable visual motor worksheets to supplement your child's hands-on activities and prepare for handwriting. Sign up for my free, occasional newsletter to keep in touch with new pages and ideas on my site.